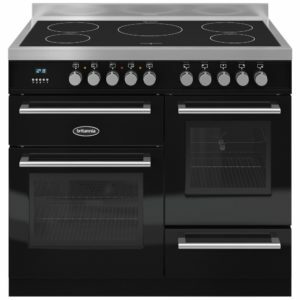 Offering versatile cooking options, this Delphi XG range cooker is perfect for every cook, from the kitchen novice to the regular baker. With a 5 zone induction hob, there's space for plenty of boiling, simmering and frying. Two multifunction ovens provide space and flexibility for cooking a whole range of delicious food and with options like defrost, pizza and rotisserie, the choice is very varied! Stay clean liners in the main oven make it easy to keep clean, and thanks to features like the handy storage drawer and meat probe, there are all sorts of great extras to help you cook. 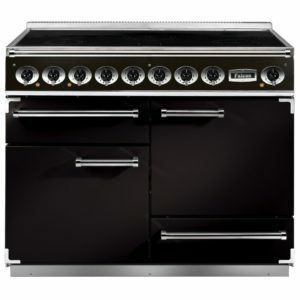 You can see and feel the high quality design and build in this superb Master Series XG range cooker from Bertazzoni. Whether it's the generous capacity ovens with multiple functions, the soft close storage drawer or the clever induction hob top, you will be able to cook up some treats in no time. 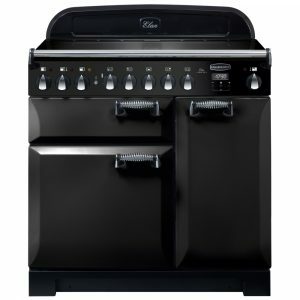 There's plenty of choice and room to select the best cooking option for every meal, and while you impress your guests with your cooking, this range cooker will turn heads with its sublime style and timeless black finish. 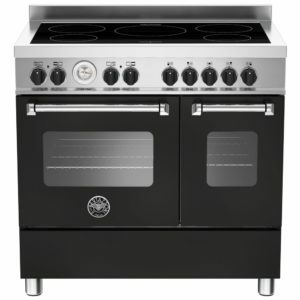 This attractive 90cm wide range style cooker from Rangemaster features electric ovens and a five zone induction hob. Finished in black it will create a stunning focal point in your kitchen. The energy efficiency rating on this model is A/A and it comes with a two year parts and labour warranty as standard. Designed to bring you professional results in the comfort of your own home, this outstanding 100cm wide range cooker from Bertazzoni offers superb cooking features. There are two spacious ovens with a great selection of features to choose from, so whether you are grilling, roasting, baking or much more, you can find the best function for every meal. Topped with a 5 zone induction hob top, you can easily fit your pans on, and with a handy storage drawer there's somewhere to pop all your paraphernalia once you've finished cooking. Finished in black, this stunning cooking is sure to turn heads in your kitchen. 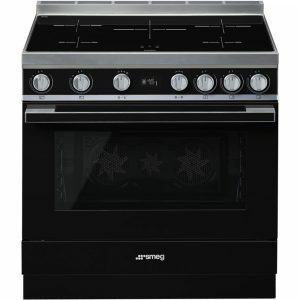 There's plenty of space for cooking all your favourites in this fantastic 90cm wide range cooker from Smeg! Finished in black and with the clean modern lines of their Portofino line of cookers, it will make a stunning focal point. The oven compartment has a roomy 115 litres of space for cooking, and with 12 functions available you can create some tasty meals! There's Circulaire, which evenly circulates heat, a grill for perfectly toasted bread or crisped bacon and a rotisserie for succulent meats, just to name a few! Pyrolytic cleaning spells the end of scrubbing the cooker, as it burns away spills, while the sleek induction hob top has the added bonus of easy maintenance as well! The Falcon 1092 Deluxe Induction Range Cooker offers the ultimate flexibility with its multifunction main oven, secondary fan oven and a separate heavy duty roll out grill. The five zone induction hob features a boost function on all zones to increase the power when required. This model is finished in gloss black with chrome trim. 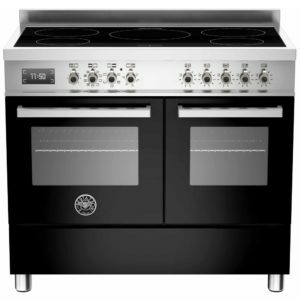 Built with Britannia's signature style and quality, this superb 100cm wide Q Line XG model offers brilliant cooking options and style. With a 5 zone hob top offering space and flexibility for all your pans, you will be able boil potatoes, simmer sauces and gently melt chocolate with ease. There's a 9 function main oven, with handy stay clean liners, not only offering a selection of functions but also hassle free maintenance. A secondary oven provides 4 further options and extra space for those large family meals! There's a separate grill compartment and even a handy storage drawer, as Britannia have thought of everything you could need for easy, convenient cooking. 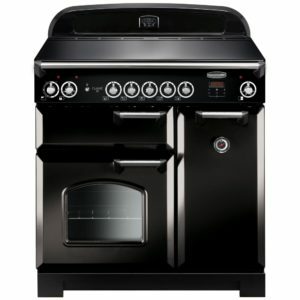 Finished in timeless black, the Q Line's sleek features and cool lines make a fantastic statement in your kitchen. Showcasing Bertazzoni's exceptional design and performance, this fantastic 90cm wide range cooker is your ideal kitchen helper. Exuding style with its black finish, sleek induction hob top and elegant doors, you will certainly turn heads in your kitchen. Offering a nine function multifunction oven, there are options for fan assisted, grill, convection and even a pizza function for crispy bases and juicy toppings. 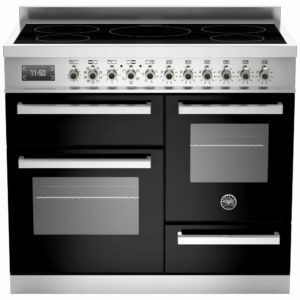 Whatever you want to cook, this superb range cooker will be able to help! 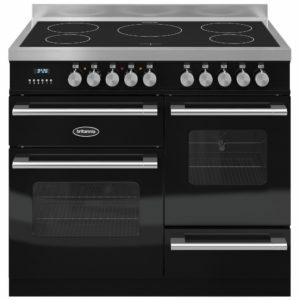 The Richmond 90cm induction range cooker from Stoves offers fantastic, traditional style with the most modern of cooking options. The fantastic induction hob top has five power zones, with plenty of space for all your pans. The fantastic multifunction oven offers 13 functions and the Equi Flow system ensures perfect distribution of heat. The secondary electric oven is not to be missed, with an outstanding 87 litres of capacity there's a huge amount of flexible space. Pro Trac double extension telescopic rails make checking on food incredibly easy and with the touch control Maxi Clock, use of the cooker is a breeze. Finished in black, it's sure to stand the test of time in design. Belling - Proudly made in Britain since 1913. 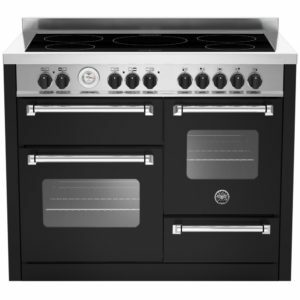 This attractive 100cm wide range style cooker from Belling features electric ovens and a five zone induction hob. Finished in black it will create a stunning focal point in your kitchen. The energy efficiency rating on this model is A/A. Beautifully designed and with an eye on performance, this stunning range cooker from Bertazzoni really ticks all the boxes. There is a roomy 5 zone induction hob top that offers plenty of space for even the largest pans, and two generous ovens. With multiple functions available, you can choose the best option, whether that is convection, fan assisted or even rotisserie! There's a separate grill compartment and storage drawer, and with a timeless black finish, it is perfect for your kitchen. 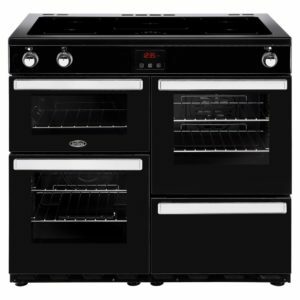 The perfect combination of traditional design and modern technology, this Elan Deluxe model from Rangemaster is perfect for cooking up treats in style! 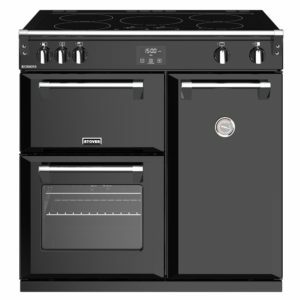 Finished in black, it fits easily into a great selection of kitchen designs, with its bevelled doors and spiral handles. There is a useful multifunction oven, so you can choose the best option for every type of meal, and if you need extra space there's a secondary electric oven and glide out grill. Look out for the Rapid Response option on the oven, which heats the cavity up to 30% faster. For when you need to boil, simmer and fry, the 5 zone induction hob top offers great space and control, so you can easily create some great food!